Rumbach? 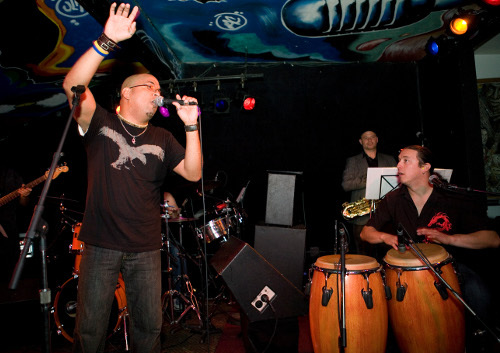 has established themselves as one of the hottest Bay Area salsa bands. Fusing salsa, timba, bomba and whatever else they could find to spicen up the mood, they provide a hard hitting style of playing. And while you can hear them interpreting the classic and contemporary Cuban and Salsa repertoire, they are not shy with their own expression. Their fresh originals make them stand-out in an otherwise cover heavy salsa scene. Rumbach? is the voice of youth for San Francisco's salsa scene, and ignites enthusiasm in dancers and musical connoisseurs alike. With a renewed commitment to public performance in 2011, Rumbach? has led a rigorous schedule of performance throughout the Bay Area, including festivals (San Jose Jazz Festival , New Orleans By The Bay,) and club dates (Jelly?s, Caf? Cocomo, Elbo Room, Glas Kat, La Pe?a Cultural Center, The Cigar Bar & Grill, Montero?s and Shattuck Down-Low Lounge).